Yes. That is an “inconvenient truth” that everyone from Milton Friedman to the lowliest academic researcher has documented. Drug abuse (which, interestingly, is nowhere defined in the law, which simply prohibits the use of scheduled substances) is a public health problem, and criminalizing it doesn’t help anyone. It does, however, incentivize the drug trade, erode civil liberties, disproportionately affect the black community and make hypocrites of us all. If pot were legal, regulated and taxed, we could control children’s access (it is harder in most communities for teens to get alcohol than pot) and generate income. Sheila has a point. Although I certainly don't want to go the route of Uruguay where government is now selling pot, we do spend an extraordinary amount of money trying to stop drug trafficking that seems to only raise the cost of the drugs and increase the profits to those involved in the industry. That taxpayer money could be better spent elsewhere. While my friends against the War on Drugs have their hearts in the right place, they are misguided when it comes to politics. 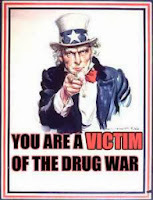 They actually believe their opponents are those who still believe in the war on drugs is good social policy, a way to stop people from ruining their lives by becoming hooked on drugs. If they could just convince those people the policy hasn't work, they believe they will win the political battle. That is so naive. The real enemies of drug decriminalization are the law enforcement agencies who have supplemented their budgets with millions of dollars in civil forfeiture money, typically money that can be spent on without any budgetary oversight. Prosecutors also receive a share of these forfeiture proceeds as well as diversion fees from minor drug offenders. These officials are going to fight like a stuck pig if their source of funds is threatened. Then you have the private correctional industry that profits off of the incarceration of drug offenders. If you decriminalize or even legalize certain drugs that means less "clients" for those private companies. Private corrections is a powerful industry that spreads a lot of contributions around and hires former politicians to exert influence. Law enforcement officials, prosecutors, and private corrections industry people will all line up to testify about the need to continue the War on Drugs. They'll say how bad drug use would be if we don't continue to prosecute and incarcerate offenders. They will claim that the War on Drugs can be won....they just need to fight harder. In the end though it will be all about the money...money they only get if the status quo continues. They are the real enemy when it comes to the movement to modify the nation's drug laws. If you want to know who is fighting to continue the War on Drugs, find out who is making money from the War on Drugs. I just read a review of Radley Balko's "Rise of the Warrior Cop, The Militarization of America's Police Forces." It seems this author provides some support for the idea that our criminal justice system, with its War on Drugs, has turned system of protecting the public into a system of protecting the police forces. It is not one or the other, it is both. It is important to realize that Americans need government permission to use ANY drug, not just intoxicants. The origin is in the nanny of all nannies, the prescription drug law, whose centennial is next year. If you have enough Money you can go into Drug Rehab, if you do not have enough money it is Jail. The Military, Police and Corrections Industries AKA Wall Street-Security-Military-Industrial Complex would bitterly oppose any Legalization of Pot. I think Pot should be Legalized and controlled similar liquor.